Don't play games online, they say. If you have to play games online, turn off chat. If you have to turn on chat, limit it to your friends list. In the past, if you've wanted to avoid the toxic jerks of online gaming, those have been your guidelines. It feels like that's finally changing. Many people had only expected online gaming to get uglier, and had acquiesced to the notion that anonymous online ugliness was an unavoidable price to playing modern video games. After all, these days, if you want to play a new game, there's a growing chance you're going to have to play online. Many of the most popular games, from Destiny to League of Legends, are online-only. Still others are greatly enhanced by being online. But for many players, myself included, the prospect of forced interaction with the sorts of foul-mouthed teen racists that we still associate with late 2000s online play is enough to sour the idea of our brave new online future. Two of the biggest shooters of the year, Titanfall and Destiny, are both online-only. Both of them offer the sorts of intense, player-vs.-player multiplayer matches that have historically been so plagued by teenaged tyrants. But I've found that if you simply log in and begin playing either game, you'll find that they're both a good deal quieter than their precursors, Call of Duty and Halo. In Titanfall, which came out in March, players largely seem to communicate using closed chat, which limits their voice communications to people they've added to their online parties. There's an open chat-channel in each match—which would theoretically allow you to hear the voices of strangers yelling or calling people names—but surprisingly few people use it. Especially on PC and Xbox One, the general consensus is that most games are remarkably chat-free. The reasons for the ubiquity of party chat aren't entirely clear. Some have theorized that the player-base on Xbox One and PC tends to be older, and older players are more likely to party up and talk with friends. That's certainly been how I play, especially when I'm playing regularly. Furthermore, the moment you join a party on Xbox One, party chat turns on by default. Parties carry over from game to game, which means it's possible that more and more people are staying in parties for the duration of their online playtime. Destiny has been even quieter than Titanfall—in the public beta, there didn't appear to be any open chat channel, and the only people a player could hear were the people in their three-person fireteam. That was true both in the co-op campaign and in competitive matches. 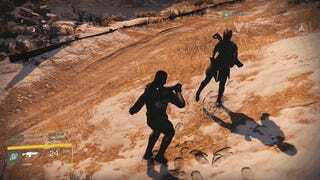 It's unclear what the chat options will be in the full game, but the beta was a remarkably chat-free experience, from deathmatches to games of duck-duck-goose. Meanwhile, fewer and fewer PC games are defaulting to wide-open global chat. The League of Legends developers at Riot Games have been experimenting with this sort of thing for a long time now, and were among the first to document positive results from simply turning off inter-team chat in League matches as a default. It was possible for players to turn it back on, but by putting that one small step between players and chat, Riot significantly reduced in-game harassment. Just last week, the company started testing another new system for banning poorly behaved players, bringing more swift and long-lasting justice to those who bring toxic behavior into their games. The popular new PC game Divinity: Original Sin used to boot up with a global chat panel open, but shortly after the game's public release, the developers shut global chat down. Why? Because the moment the public entered the fray, "It seemed like the floodgates of hell were opened," one of the game's creators told me. There may be no game that inspires more trash-talk than Mario Kart. But online play in Mario Kart 8 has no chat options either, meaning that it's impossible to scream at the person who just pegged you with a shell as you rounded into the final stretch. As our own Yannick LeJacq points out, it feels a tad unusual to play Mario Kart without trash-talking, but then again, we're mostly used to trash-talking our friends and roommates in that game. I sense that when taken online and opened up to a randomly selected group of players, the game's chat would spiral out of control in no time. Some sort of friends-only chat would be fine, but I can certainly understand why a notoriously conservative company like Nintendo might err on the side of caution. The price of limited online chat is too high for some gamers. It indirectly—and sometimes directly—hurts gameplay, they say. 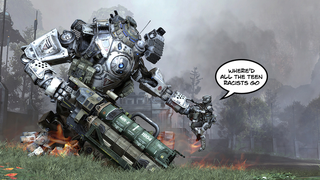 "Party chat destroyed multiplayer," wrote a commenter on a recent Titanfall story. "Imagine the people who just started online gaming with Xbone and PS4. Who are they going to 'party chat' with? The people I party chat with are people I met playing games back when 'regular chat' was the way chatting in multiplayer worked." Does Chat Actually Improve Teamwork? Chat is generally seen as an important part of playing games online, not because it allows you to meet new people and taunt your opponents, but because it helps you communicate with your team and, in theory, play better. Turns out that isn't always the case, at least not with every game. Recently on the League of Legends forums, a user asked whether a chat-restricted player could negatively affect his or her team's performance. Riot's lead social systems designer Jeffrey Lin explained that players who don't use chat and rely on the "smart pings" system—a series of pre-baked commands like "Danger" and "On My Way"—do just fine, sometimes even better than those who use chat. "For a large number of players, chat restrictions actually increases their win rates," Lin wrote, "because being verbally abusive to teammates tends to make the team's performance spiral negatively." All of this comes down to two things, really: Options, and defaults. It's always better for game developers to give us more options. More options for how the game looks, plays and sounds, and also more options for how we communicate with each other. Destiny would clearly benefit from a more flexible voice-chat system. It'd also benefit from giving players a big wheel of varied gestures, so that players who don't want to chat can have other options for communication. The more options that are made available to players, the more important it is that the game's creators put a lot of thought into which options they turn on by default. As Riot learned with League of Legends, simply turning off inter-team chat by default—instead of removing it entirely—significantly lowered the amount of negative chat and harassment that happened in every game. Blizzard still makes it possible to send taunting, angry messages to people you won or lost to in Hearthstone, but by removing the ability to do so while in a match, they've no doubt significantly cut down on taunts and harassment. It's nice to see games including more options to let us communicate with one another, while adjusting their default settings to let more new players feel more comfortable. Harassment will continue to be a problem in online games, particularly for women, and negative chat will continue to keep quieter, shyer players at bay. But progress is progress, and if you fire up a new online game in 2014, the chances have greatly increased that your first experience will be with the game itself, not with the angry, muffled voice of a stranger.